Yakuza drinking custom or hepatitis vector? I’ll report, you decide. Grrr!!! Just typing that evil tagline makes my gorge rise. Either that or I just had a gentle reminder of a forgotten fact: hanging out with Japanese men tends to include drinking to ridiculous excess. Last weekend was the long scheduled Mieken Aikidokai road trip up north to the Awara onsen (温泉 — hotspring) in Fukui. We boarded the Powertard enabled charter bus at 7:25 am and drinking began promptly at 7:30. Including rest stops (lots of bathroom breaks for beer drinkers), lunch (a nice soba set) and the obligatory visits to every omiyage-ya-san (おみやげやさん == tourist trap) in Fukui prefecture, the trip lasted about nine hours. In other words, there was sufficient time for several severely embarrassing incidents and time for even relative innocents to become blasted out of our (again, relatively) innocent skulls. So, with a bellyful, we arrived at the resort and promptly began hot-tubing. The water in the indoor tub was very hot (42ish). That said, it was a typical onsen with an outdoor boulder field forming a pool and individual tubs under a small thatched roof. The light sulfur vapors were atmospheric rather than miasmic and the light salt of the water left a nice feeling. 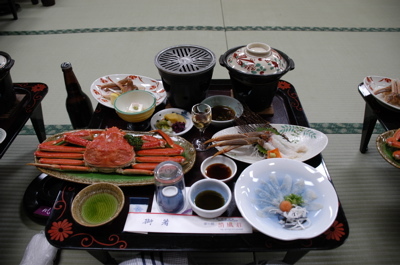 The main meal was set out enkai (宴会) style in a 56 mat room. Mini tables were laid out to form a “U” with the open mouth facing a stage and karaoke machine. Even with the threat of karaoke hanging over my head, the meal was excellent. The theme of the main meal was “Crab vs. Blowfish”. Though the fugu was excellent, the crab won a solid victory with two out of three falls. Whole crab, crab sashimi, ami-yaki-crab, and crab cooked into rice (awesome stuff) went up against fugu sashimi, deep-fried karaage fugu and fugu soup. The sweet meat of the crab leg sashimi was my favorite but the homey flavor of the taki kome gohan (the crab and rice dish) was a close second. Drinking was also an important part of all this. Ume-shu was set as aperitif, hot sake and beer bottles were liberally lined up beside each table. One very nice element was the rowdy nature of the crowd. Nobody waited for the kampai — they just started to dig in. As usual, we poured each-others’ drinks and, after eating enough, people began to mingle. This meant plopping down in front of someone else’s table, pouring them a drink and having them pour for you in turn. This is where it gets yakuza. Actually, I have no idea of the origin of the custom but all the old men knew about and one insisted it was common among the tattooed class. None of the women were aware of it. At any rate, Sashitsu Sasaretsu is about bonding by sharing a cup. One side pours, the other side drinks the cup to the bottom and dumps out the dregs (often into their own palm). The drinker then refills the cup for their friend who drains it in turn. In a group, the cup is passed around until the first pourer is the last to drink. There are customs surrounding how to hold the cup and how to pour. There are ways of doing both that are considered “correct” while other ways are considered insulting. Given that, I can understand how a whole episode of Japanese Sopranos might turn on the angle of a beer bottle. 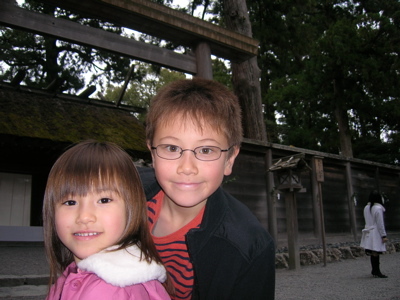 Ray and Kokoro at Geku. My career as a thief started several years ago at seminar at Aikido Eastside. While changing, I overheard part of a conversation between Ledyard Sensei and another local instructor whose name escapes me. They were talking about how Ikeda Shihan (Boulder Aikikai) would unbalance his uke at the moment contact was made. Having experienced this personally (back when Boulder Aikikai was in the dome — long ago) I was very curious, so I listened in. It wasn’t a private conversation and it was held in a crowded public space but I still felt uncomfortably like an eavesdropper. Sensei’s explanation was straight-forward and for the next few weeks I experimented with it. Unlike most thieves, I have kept this bit of treasure and tried to polish it over the years. Much later, I had the concept of “Stealing Technique” forced into my awareness. That training in the martial arts is an active experience is obvious. Students need to be aware of what sensei and other students are doing while taking mental notes about proper foot position, angles of hips and shoulders and all the other factors that all add up to proper execution of the art. From an American perspective there is also an expectation that there will be some sort of exchange indicating what needs correction. However, I am now in territory that is new to me. My sensei says that he will no longer correct me and it is entirely my responsibility to steal technique from him. This is not punishment, he seems happy that I have gotten to the point in my training where benign neglect is the preferred form of pedagogy. As a result, I find myself “eavesdropping” in class. When sensei gives the slightest correction to anyone near me I take it to heart myself and double check my feet or posture or whatever correction he is giving. I no longer feel the slightest guilt when I overhear comments even vaguely Aikido related. I can filter what I consider far-fetched and integrate the rest. Some day, some of the far-fetched may become useful and they too will be integrated into my whole. For now, I am stealing words like gold and am happy for every one that I can get. My real challenge is stealing the details as sensei demonstrates technique or principal. Mind you, I can’t complain as this is the same challenge that all students face. For each of us, learning is just a matter of how much we can steal. So, you’re done with dinner, please be sure to ask for the right one. Now which was it again? This usually confuses people when you are trying to indicate that a woman is middle-aged but you tell them she is a granny. BTW, both are pretty common ways of referring to strangers whose name you don’t know. Same as for women though less likely to cause verbal beat-down when the mistake is made in conversation. There has never been another verbal slip up that has gotten me in more trouble… If you ever need to a wake up call, please get the pronunciation right! Just give it up. If you are communicating with someone and they’ve lost context so badly that they’re not sure whether you’re talking about a chopstick, bridge or the edge of something, just give up — you’ve lost. Let the poor sot be “enigmatic” in peace. I complain about the cold and report about the bathroom here too often but they are closely-linked, painful topics. The lack of insulation in this office building makes it very uncomfortable to work without several layers of clothes. Since corporate uniforms are mandatory for all, except upper management, everyone wears as many layers as can be made to fit under their polyester crap-wear. Fortunately, the clothes are so ugly that even the most vein among us have given up trying to look nice in these things and can concentrate on adding more lumpy layers of undershirts. Adding to the discomfort is this company’s policy of not activating the heat until December 1st. This doesn’t really apply to me or my team as the heating ducts don’t reach to our end of the office so we froze our asses off all last winter. At any rate, for some, there will be relief in the next few days but for me, I am counting down the days until I leave this company (30 more). Most people seeking employment are interested in salary, benefits, corporate position and office location. I am also interested in these things but I have found myself focusing on other details when visiting offices for interviews. 1) Is the place heated/air-conditioned? 2) How are rank-and-file dressed? 3) How do managers dress? 4) Are the desks/workstations made for computers or are they sharp cornered battleship gray 1950s style beasts guaranteed to leave creases in your forearms? 5) Is the bathroom ventilated? 6) Is there a ventilated smoking area? 7) Do I have to walk through the smoking area to get anywhere for work purposes? These may sound trivial but every one of them has made my working life uncomfortable over the last year. Perhaps it is the combination but all, and worse, are fairly typical of Japanese companies so I am on the look out when interviewing. Another thing I should probably watch out for is harder to spot. Modernizing and improving the trivial while neglecting bigger issues. An example of this here is the Mitsubishi Jet Towel installed in the visiting men’s rest-room. Since the bathrooms in my office are not insulated and windows are left open for ventilation, in winter they get very cold. Right now, it is about 8 degrees C. Given an airspeed of 90 m/s blasting out of the jet towel, the wind-chill on wet hands is about -2.6C. I salute the reduction of waste and the improved hygiene afforded by this tool but there are implementation issues that should be addressed. For example: WHY CAN’T WE TURN ON THE HEATING ELEMENT UNTIL DECEMBER FIRST???? A few things that Japan has not learned in the green department have been chaffing the more sensitive parts of my soul today. The first that leaps to my frozen fingers this morning is the desperate (DESPERATE) need for insulation in homes and buildings. Though the weather in Ise isn’t particularly chilly normally, it is painfully cold INSIDE. Neither the house where my family lives nor the building where I work are insulated. My son’s elementary school has cold concrete and steel walls. Heat leaks through the aluminum framed single-pane windows, doorway gaps, ventilation holes and open bathroom windows (no vent fans where really needed). Ise feels much colder than it really is! I grew up in Wyoming (Note to non-Americans and New Yorkers: Wyoming is a frigid rectangle in the US section of the Rocky Mountains) so, I am not a cold wimp. However, I do expect to get warm once I’m inside. This is generally not the case here in Ise and in other parts of Japan too. I know the folks up in Hokkaido have discovered the mystery of insulated walls but much of the rest of the country is missing out. In fact, my wife pointed out an ad for “Canadian Houses”. These are 2 by 4 construction type houses with both central heating and insulation. The quotes from owners in the ads all dealt with how surprisingly warm they were even with heat turned low or off. We both laughed hard enough to not be envious — for a while. The envy came back hard this morning. With the heated seat of the toilet below and a chill breeze through the window above confusing my barely awake body, I decided that I really wanted some of that Canadian house action. Since we are going to move to Tokyo my Canadian House will remain a fantasy. I just have to hope that the combined body heat of 35 million other folks in the greater Tokyo area will keep us warm! For experienced expats and Japan-o-philes re-using tub water is old-hat. For Americans interested in green lifestyle options this may be interesting. In Japan it has been common to share baths and bathwater for a very long time. In modern practice that means taking turns in the bath without changing the water between uses. I have heard American friends and family say “gross” when hearing this but they often miss the point. Japanese people shower or dip water out of the tub with a bucket to get clean before hopping into the tub to soak and relax. It is common to cover the tub with a thermal lid to preserve the heat for the next person. The re-use does not end there however. Many modern Japanese clothes washing machines have built-in pumps and long hoses made to drain the tub for washing and rinsing clothes. Imagine! A family of three might use the same tub of water four times. This is a cultural/technical idea that people in the US should consider adopting as many regions of the US are already suffering from severe water shortages and more will be soon. As is so often the case, that would mean a change in our way of thinking — how uncomfortable!